I love it when they are new and white, I wish they stayed that way. Sweet, thanks for the recommendation! I would love to see some people experiment with it while keeping strict documentation. I think that would be very interesting. I don't want to start a fight though! I suspect there are probably a couple of species that we don't think can hybridize that actually can. Haha oh wow. Well all I know is they breed like mad and my beardie loves them. I asked the guy they came from he swears they are just craniifer/discoids. Who knows. I'll call them Baskin Robins roaches, 31 flavors. Interesting, maybe because my experience is with so few that I'll run into this in the future, hopefully not. I have no problem at all with A. tesselatas though, I have two huge display tanks and I even gave away a bunch for free because of over crowding. I'd be very interested to see this tested in a study. I love roachcrossing, when I first got into the hobby I got most of my colonies from Kyle actually. His selection and customer service is amazing! Here are some pictures of those hybrids. There is a lot of variation in the colony when it comes to size and color. There are some very light adults and some very dark ones. I have separated out some of the light ones before to see if it was just a molting issue where they hadn't hardened up enough yet, but nope, they stay light. Some of the nymphs are black and some look dubia color also. Some of my adults are the size of an A. tesselata, and some are not much bigger than an E. posticus. Thank you! I was nervous to start breeding these because I have heard so many horror stories about them dropping dead all over the place for no reason. I haven't had any problems with them though and they are popping out babies like no one's business. They're actually getting a tank upgrade today because they are over crowding. I've seen lots of people saying they have craniifer/discoid hybrids, really they can't hybridize? They are both Blaberus sp. though right? Hmm I don't know, I'm just going off what my friend told me, I can post some pictures later when I'm home. I wouldn't use vaseline if the temps are going to be that high, it will just melt and run. 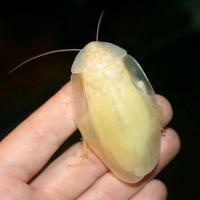 I would either go with a completely closed off enclosure, or use a species of cockroach that doesn't climb glass. But since I'm a sucker for climbers, I would just do the screen vent idea.